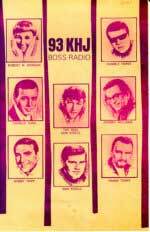 And, Robert W. Morgan arrives in Los Angeles as the original morning "Boss Jock" on RKOS, Drake-Chenault consulted, 93 KHJ. with Mama Cass His signature "Good Morgan" has awakened Los Angeles ever since. Robert W. was the man to give you that extra-added boost...ZAP, you're Morganized!